Desolate world: "That's a communications system. It needs repair, but I'm willing to bet that you've brought one of those famed Starfleet engineers who can turn rocks into replicators." Mission located in Alpha-Quadrant with span: 2 and points: 45. This card have been fully converted from 2E into 1E under OTF rules - please use Signal for Rescue from Homefront IV instead. 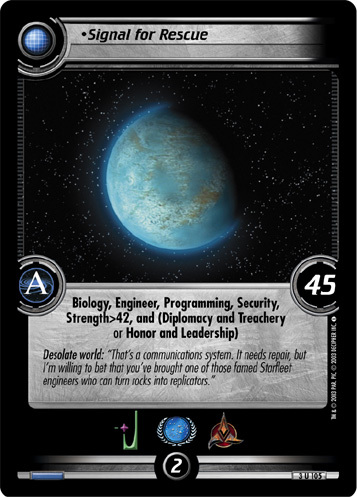 "Signal for Rescue" is a backward compatible card form the Second Edition expansion Call To Arms - ST1E compatible (Copyright 2003 by Decipher). See collectors infos for this card in the Second Edition section under the UCT-ID: ST2E 3 U 105. Also see here for all trade lists with any card fom "Call To Arms - ST1E compatible".